The most important decision you will make is choosing to play a starting hand. The biggest mistake a player makes is playing too many hands. Being aware of your Position in relationship to the dealer is important in Texas Hold’em. 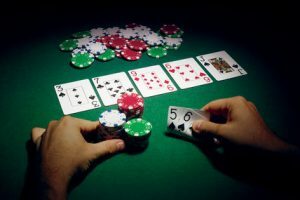 You need a stronger hand to act from early position because you have more players acting after you who may raise or re-raise the pot. It is important that you are Patient and wait for Powerful starting hands to play from the correct position. Call with A-Xs, K-Ts, Q-Ts, J-Ts, A-J, A-T and small pairs. (note x denotes any card) It takes a stronger hand to call a raise than it does to make with one, If there is a raise before it is your turn to act you should fold. As with the Turn you should bet your hand if you are first to act. If you bet and the other player folds then they more than likely would have just checked if you had checked in an attempt to check raise.